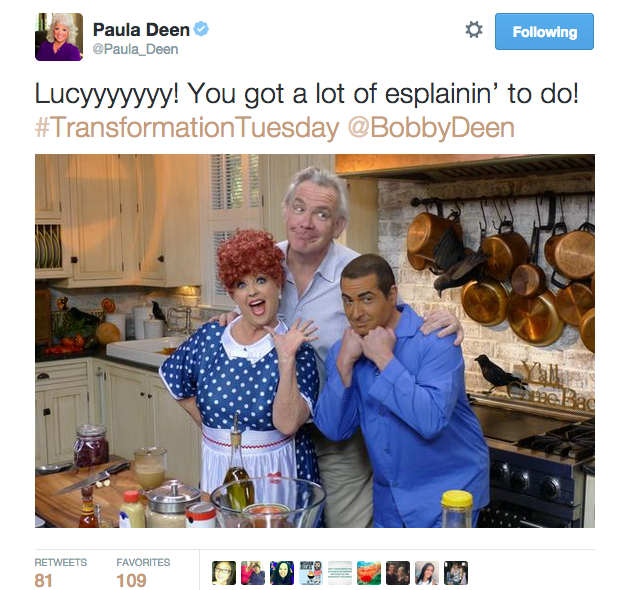 Paula Deen angered most of the Internet on Tuesday by Tweeting out an old photo of her and her son Bobby, dressed as Lucille Ball and Desi Arnaz. Her son, notably, was in brownface makeup. The photo was hashtagged #TransformationTuesday. Deen has since deleted the Tweet, and she has not responded on Twitter to the torrent of comments that have sprung up in its wake. She does, however, hope y’all have heard the great news that she has a new cookbook available for pre-order. Related: What Was Chef Bobby Deen’s Biggest Cooking Disaster?